talking to the competent Marc Bellier, so your other half might get lost in the nearby Rue du Faubourg Saint Honore and transform her, or your, credit card in a melting mass of plastic. A Springbank Local Barley will look cheap compared to half an hour shopping in that street! There are many wine shops where I always like to stop by. It is always interesting for me to see wine selections from all over France and the world. By far the largest and most impressive would be Lavinia, Blvd de la Madeleine, with their multi layered floors and huge selections. They also have a great spirits selection, and, because of their Spanish connection, a fantastic selection of rare Chartreuses from Tarragona (a sweet high abv plant liqueur made by the Chartreux religious order). If you think single malt has become expensive, try to buy an 1960’s Chartreuse… Again, a Local Barley will look dead cheap. In a much smaller scale, but with a selection of wine just as impressive, the Verger de la Madeleine (Blvd Malesherbes) or the Caves Auges (Blvd Hausmann) will be more approachable, with the possibility to converse with the owners, and also the opportunity to have access to rarer or older wines. My absolute favorite, I must confess, is the Caves Legrand, located in the oldest part of Paris, in the Gallerie Vivienne, near Rue de la Banque (actually just a block away from Whisky Live’s Palais Brogniard). The shop is spread over different rooms, displaying a huge selection of fine wines, not just the fancier labels, but anything worth of interest. What also should motivate you to go there is the fact that there is a small wine bar, offering a very interesting selection of wines by the glass and some plates of cold charcuterie or various tapas. There are also many ‘top’ restaurants in Paris, as you know. If you want to experience excellent French cuisine and some whisky, go try the new Lucas Carton. No more 3 stars, as they ‘downsized’ their operation to 1 Michelin star and gave it a look of ‘luxurious brasserie’. The food is really excellent, produced by a skilled team lead by Alain Senderens. On their menu, they advise a glass of wine with each course. This wine is carefully chosen by the chef and sommelier to pair the food the best way possible. Each time I have been there, they always had a starter that was proposed with a glass of whisky. Last time, I had a ‘dos de saumon’ (salmon back), beautifully cooked and served with a Talisker 10yo OB. I always liked this whisky and felt that it paired this dish beautifully. Adding some water helped a lot, as it revealed even more the smoke, made the palate taste sweeter and didn’t overpower the fish course. There is one restaurant in Paris I always wanted to go to, but never managed to get in. Not only you have to book a long time in advance, but you have to be ‘properly’ introduced. 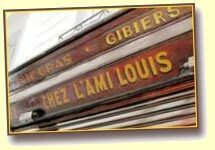 This place is called l’Ami Louis, in the 3rd arrondissement, rue Vert-Bois. Last December, my friend Jean-Jacques, also a great whisky fan, who has been there for many years, told me that he would be in Paris at the same time as me and managed to get a table for lunch. L’Ami Louis keeps a low profile inside out. It is a very small brasserie-like restaurant, only maybe 8 or 9 tables, all cramped together in a small room, with just one narrow alley in the middle. The room is paneled with old dark oak, the tile flooring has seen Louis XV and in the middle of the room, there is an old cast iron stove, warming up the room in winter. As you walk across the room, you have to bend under the exhaust metal pipe that runs across the room. At the opposite of the entrance, there is an opening where you can see the tiny cuisine with all the chefs hustling behind old traditional wood ovens. All the staff is dressed in the old fashioned black and white coats…Don’t get me wrong, the place has certainly seen many wars, but looks actually great. I’ve heard friends sitting back to back with Demi Moore or others with Jacques (the tall one, past French president)…So you guessed it, it is also a place where celebs and politics go to. Rest assured, we went there to eat, drink and have fun! At l’Ami Louis, you do not order a menu or a course, you order food. You can choose amongst a list of simple foods like scallops, chicken, foie gras, beef, duck… If you choose the foie gras, you will receive half a kilo of foie gras. If you take the chicken, you do get the whole chicken for yourself, if you choose scallops, you do get the whole pan… Each main course is served with delicious French fries, a mountain of it, and they replace the plate with fresh ones every 10 minutes. You guessed it, do not eat a few days before going there and do not plan traveling just after! The wine list is monstrous, it has a huge selection of wines, mostly Bordeaux based, and mostly quite expensive, but it is possible to find real gems, like this Chapelle d’Ausone 1998 (the second wine of Ausone in Saint Emilion from an excellent vintage). Towards the end of an excellent meal, we both felt like having a good whisky. I could see three bottles only on top of a shelf, almost unreachable, except for me of course. The two first ones were recent ‘mundane’ malts, nothing to get excited about, but the last one was a Lagavulin 1981 Distiller’s Edition (43%, OB, Pedro Ximenes finish). I knew that some of those older DE were excellent, but, waow, we didn’t expect it to be that good. Whisky works just like the food at l’Ami Louis, if you order one, you keep the bottle on the table until you’re finished with. I guess they expect most people to take only one glass, or just a little top up. The bottle was half full, and an hour later it was empty… What a great whisky! The peat combines perfectly with the sherry. The nose is intense, shows all the classic tar, smoke one expect from a Lagavulin, but gently softened up by the fresh fruits, raisins influence of the PX. The palate is elegant, doesn’t feel heavy, there are no sulphurs or overly powerful gunflint character, just beautiful pure sherry influence and smoke. It is not a light whisky, but the lower ABV makes it so easy to drink. It fully deserves that outrageous 92 points rating. I do hope that they have more of this whisky in their deep and dusty cellars.